Nao figurines and porcelain pieces are easily recognized by the simplicity of their form and choice of lighthearted subjects. NAO porcelains are not “seconds” that didn’t meet Lladro standards, on the contrary, they are pieces created by a team of very talented sculptors at Lladro-owned workshops in Xirivella, Spain. 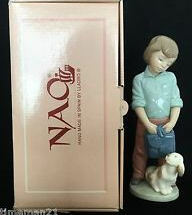 Nao’s beginnings came from expansion efforts by the Lladro company. They bought a small porcelain factory near their home city of of Valencia and after a couple name changes it eventually became Nao porcelains,or more popularly – Nao by Lladro. 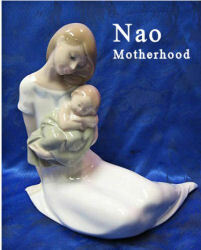 Here is a more detailed article: The history and factory marks of Nao by Lladro porcelains. 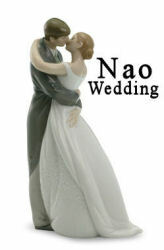 With over a million search results returned for “Nao by Lladro figurines,” smart shoppers and collectors know there is one easy place to check first for the largest selection of available figurines in one place, and it also almost always has the best prices – ebay! With the largest available selection in one place, and prices set by buyers and not sellers, ebay should be your first stop to find that special Nao figurine you are looking for. 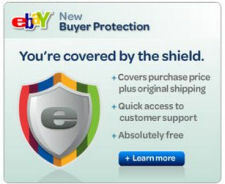 No longer the “flea-market” of its early years, ebay has become one of the most trusted online market places for collectibles of all kinds. Even experienced porcelain collectors and appraisers check ebay for price evaluations and availability. ebay should be your first stop to find that special Nao figurine you are looking for. Especially for a collectible as popular as Nao. 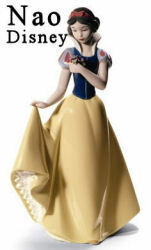 Save hours of searching by using these direct shopping links to Nao pieces available right now. • See how to find Nao figurine values.